So yeah, those were the exact words of a fellow mom at gymnastics today. She herself has two girls around Abby and Billie’s age, but for some reason she thinks my girls are particularly awesome – had they been boys. For some reason I feel like I have to make up excuses for people not being able to get my kids’ gender right. The other mom, who I usually refer to as The Hippie Mom, is actually pretty cool. Like, she has this hippie kinda vibe about her, hence the nickname – and I mean that in a very positive way. She’s pretty relaxed and she’s very loving towards her children – not a given around here, but that’s a whole other, controversial story I might get into someday, if I’m brave. The Hippie Mom got a bit embarrased, but said that she loves it when people challenge stereotyping. Cool! What puzzles me is that she doesn’t seem to do it herself. If she really dreamt of having two wild boys – why can’t she have two wild girls. Fair enough, her children might not be wild from nature. That’s fine. Maybe they wouldn’t be if they had been boys, neither. Actually, I take what she said as a compliment. I love that my children are wild and energetic and make a good impression on people. But I find it a bit sad that their behaviour is somewhat sought after – if they were boys. I believe that, at least in general and especially here in Australia (over Denmark), girls get treated just a little bit different. They get put into pretty little pink outfits. They get told it’s dangerous to climb high. They get told to be careful when they run wild. They get given just a tiny bit less freedom to move than boys. And if the boys are being wild and crazy ‘they are just being boys’ – if a girl acts the same way, it’s not really acceptable or ‘she should have been a boy’. That last sentence annoys me to the moon and and the stars and beyond. No, she should not have been a boy. Not unless she feels uncomfortable with the gender she has been born with. She’s a girl. And girls can be wild. Just like boys can be sensitive and play with dolls. I guess my point is, one thing doesn’t have to rule out the other. Being a girl or a boy should not dictate how or what you play. Or how you are acting at gymnastics. At gymnastics our girls are quite cheeky. Especially Abby is in her element there. She makes jokes with the teacher – who calls her crazy – and she is all over the place. The girl’s got energy and that energy needs to get out somehow. She’s also pretty loud. And she never wants her hair up. 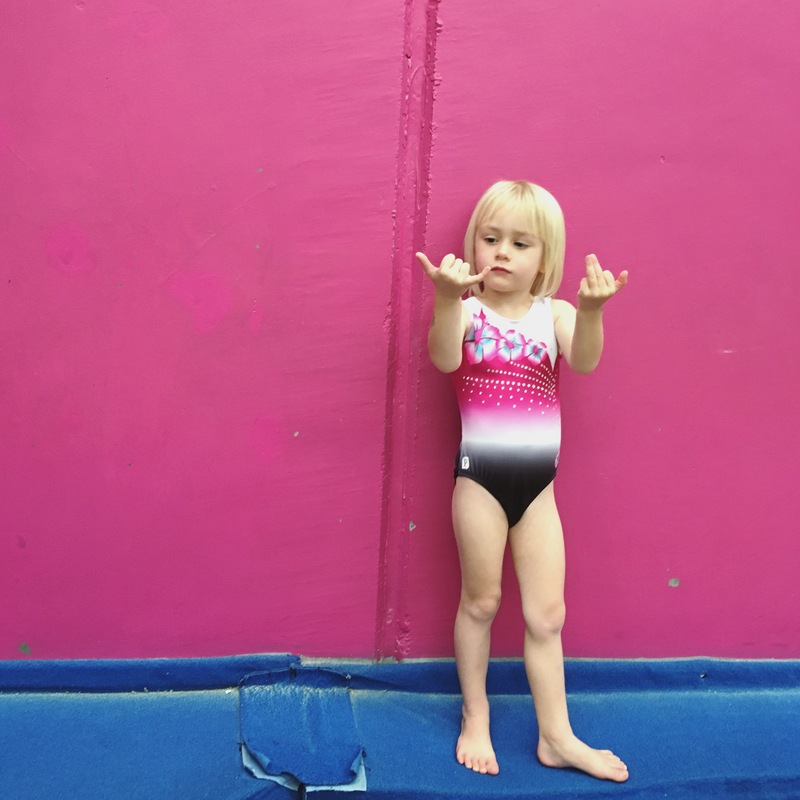 But most days she wears the most girly-girly little leo tard known to man. However, as soon as she rocks up in a more neutral outfit people completely forgets and thinks she’s a boy again – mainly due to how she behaves, I think. I think she’s perfect, just the way she is. So is her sister. Sometimes they are wild. Sometimes they are calm. Sometimes they wear pink. Sometimes they wear grey. They are always girls. I truly hope that they will stay true to themselves, and not cave in too much to what society tells them about being “real” girls. Not now and not in 10-20-30 years. Maybe our two rascals will even inspire The Hippie Mom and her girls to be less worried about how girls are “supposed” to look and act. That would be awesome. IS IT OKAY IF I’M IN LOVE WITH MY KIDS’ PRESCHOOL TEACHER?